When you look in the mirror, do you see dark and discolored teeth? If so, you are not alone. Tooth discoloration is a common concern. Although they naturally become darker as you age, there are several factors that influence the rate and severity of staining. 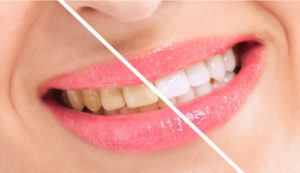 To restore the color of your enamel, you have probably tired over-the-counter whitening products but were quickly left disappointed because they did not give you the results you had wanted. Now, you can get your smile several shades whiter with results that last. Your dentist in Allentown, Dr. S. John Salivonchik, offers the solutions you need. Teeth naturally discolor as you age, but there are several factors that increase how quickly and severely they will change color. Darkly pigmented or acidic foods and drinks, like coffee, berries, and tomatoes, will stain your enamel. In addition, poor oral hygiene habits and tobacco use will also increase a brown or yellow appearance. In some cases, they may take on a dark appearance due to medications, such as tetracycline. When your teeth are discolored due to age, lifestyle habits, or food, a professional whitening treatment can resolve the discoloration. Instead of in-office treatments, we use at-home systems that provide professional quality results. You will get your teeth several shades whiter from the comfort of your home in about two weeks. This method is often proven to be more effective than systems that offer same-day results. After performing an initial consultation, Dr. Salivonchik will create a treatment plan. Impression are taken to develop custom-made whitening trays. Not only do these provide a more comfortable fit but also ensure the even distribution of the whitening agent for more consistent results. You will then wear them along with the professional-grade whitening agent each day. In 10 to 14 days, you will have drastic, lasting results. Although the at-home hit is effective, if your discoloration is due to medications, it will not be effective. Instead, you may need a more advanced procedure to hide the dark appearance of the teeth. Often, dental bonding or porcelain veneers are recommended to conceal the darkened enamel. If you choose the at-home kit, you will enjoy lasting results if you properly care for your teeth. In addition to brushing, flossing, and visiting your dentist, it is best to limit your consumption of darkly pigmented or acidic foods and drinks. Although you cannot avoid them altogether, you can still enjoy them if brush your teeth afterward. If you cannot do so right away, rinse your mouth well with water. If you use tobacco products, it is best to stop as soon as possible to protect your teeth and overall health. Where Can I Brighten My Smile? If you are ready to love the smile you see in the mirror, it is time to see if a professional whitening treatment is right for you. Contact our office today to schedule your consultation.